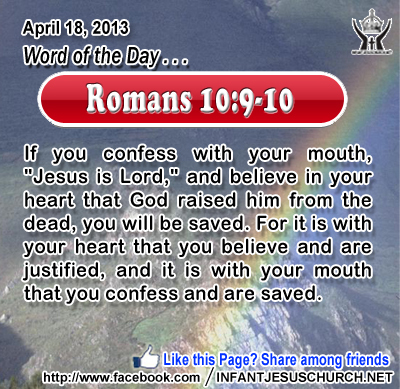 Romans 10:9-10: If you confess with your mouth, "Jesus is Lord," and believe in your heart that God raised him from the dead, you will be saved. For it is with your heart that you believe and are justified, and it is with your mouth that you confess and are saved. Heavenly Father, Jesus your son is our Lord. We love him and praise him for his redeeming sacrifice. We thank him for his conquest of the grave. We marvel at his sacrificial and triumphant grace. We know it sounds sweet in your ears so we say it again, Jesus is our Lord. Thank you for being so great that you would be so sacrificial. In the name of Infant Jesus we offer this thanks. Amen. 44No one can come to me unless the Father who sent me draws him; and I will raise him up at the last day. 45 It is written in the prophets, `And they shall all be taught by God.' Every one who has heard and learned from the Father comes to me. 46 Not that any one has seen the Father except him who is from God; he has seen the Father. 47 Truly, truly, I say to you, he who believes has eternal life. 48 I am the bread of life. 49 Your fathers ate the manna in the wilderness, and they died. 50 This is the bread which comes down from heaven, that a man may eat of it and not die. 51 I am the living bread which came down from heaven; if any one eats of this bread, he will live for ever; and the bread which I shall give for the life of the world is my flesh. Jesus offers us the plentiful supernatural life of heaven itself - but we can miss it or even reject it. To refuse Jesus is to reject eternal life, unending life with the Heavenly Father. To accept Jesus as the bread of heaven is not only life and spiritual sustenance for this world but glory in the world to come. When we approach the Table of the Lord, what do we expect to receive? Healing, pardon, comfort, and relax for your soul? The Lord has much more for us, more than we can ask or visualize. The principal fruit of receiving the Lord's Supper is a friendly union with Christ. As bodily nourishment restores missing strength, so the Eucharist strengthens us in charity and enables us to break with disordered affections to creatures and to be more firmly rooted in the love of Jesus. Do we hunger for the "bread of life"? Loving Jesus, you are the living bread which sustains us in this life. May we always hunger for the bread which comes from heaven and find in it the nourishment and strength we need to love and serve you wholeheartedly. May we always live in the joy, peace, and harmony of the Father, Son, and Holy Spirit, both now and in the age to come.